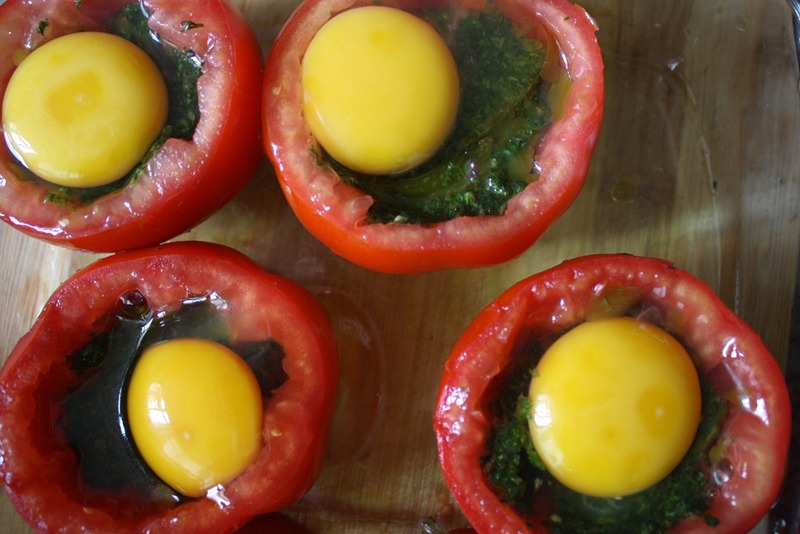 Now here’s a fun and pretty way to have your morning egg. The tomato acts as a cup to a simple pesto (without the cheese and nuts to weigh it down) and a whole egg. 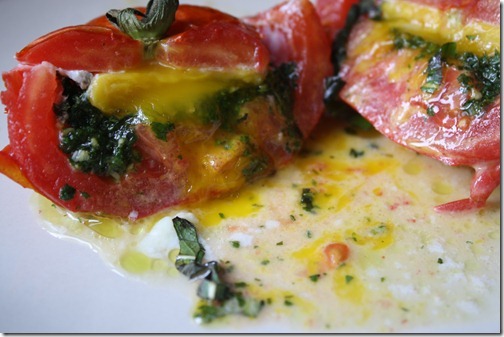 For health’s sake, please always have the yolk! This is a savory approach to breakfast, and it’ll keep you full for hours. 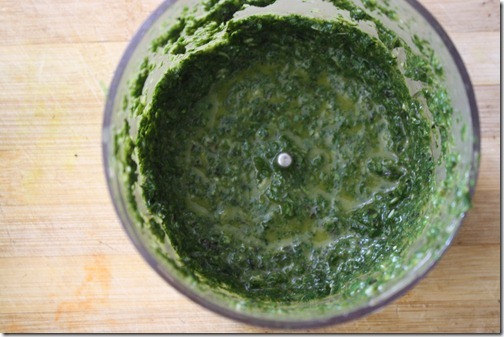 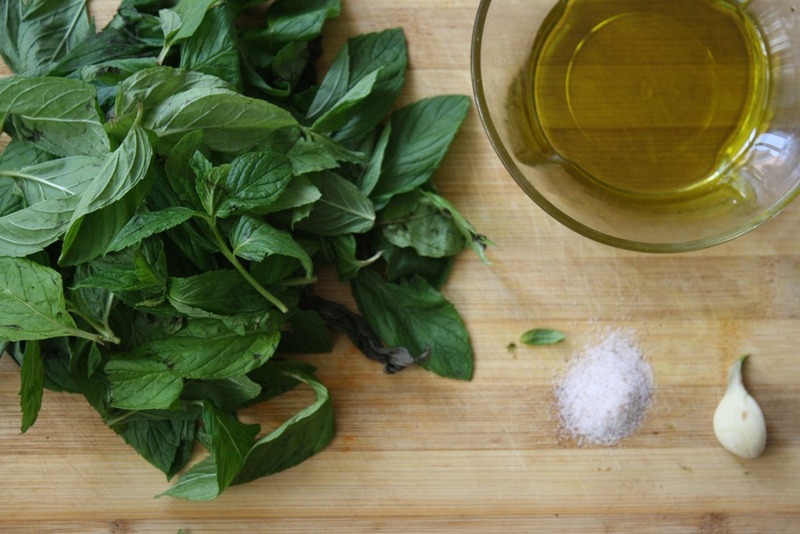 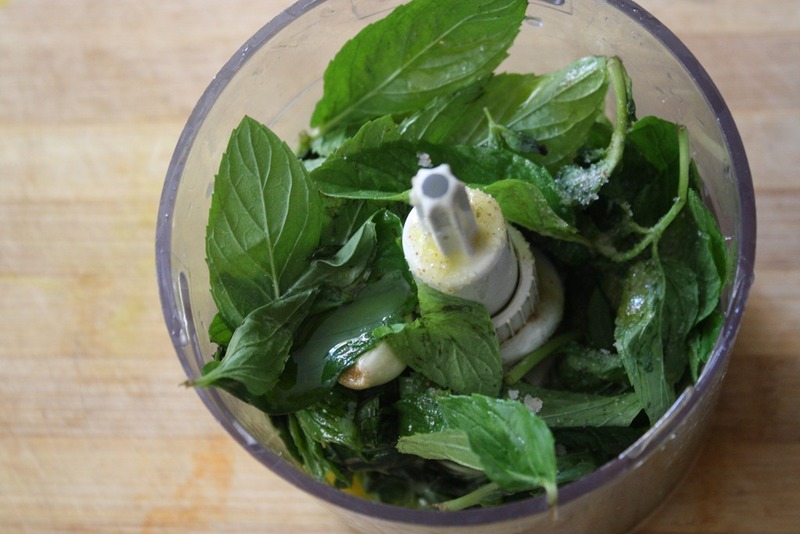 For the pesto, combine all ingredients into a food processer and blend until smooth. 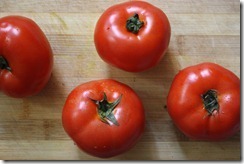 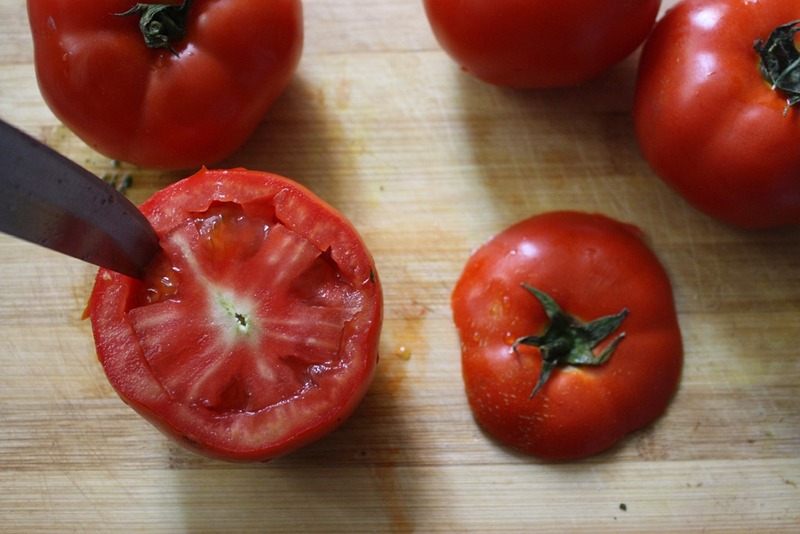 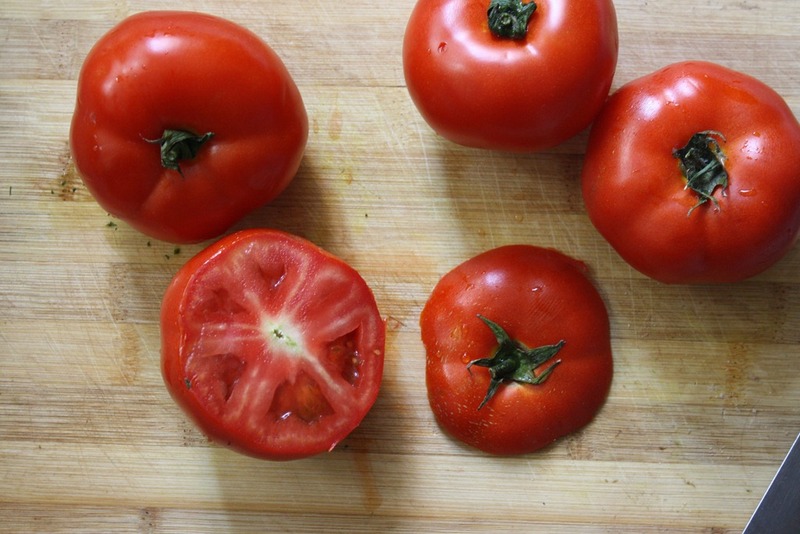 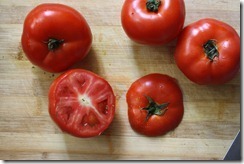 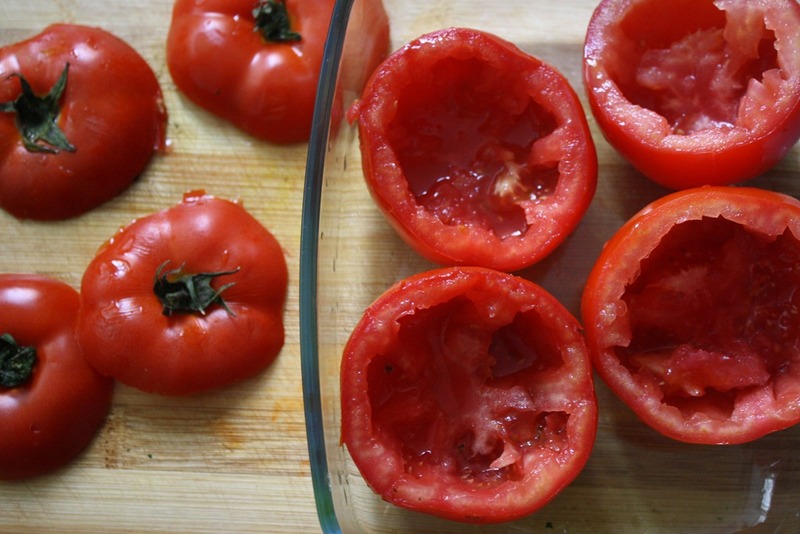 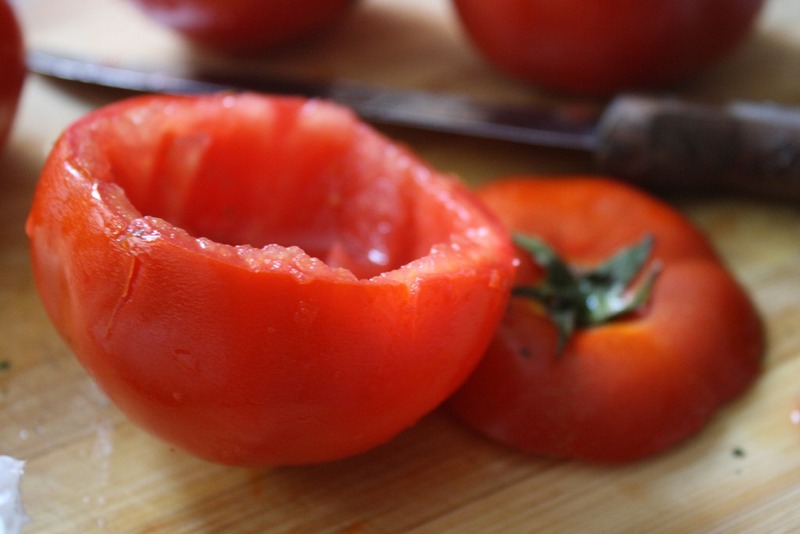 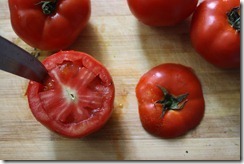 Prepare the tomatoes by cutting 1/2-inch thick slices off their tops. 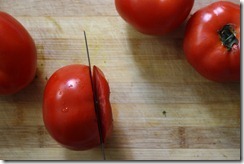 Carefully cut and spoon out the inside flesh without penetrating the skin. 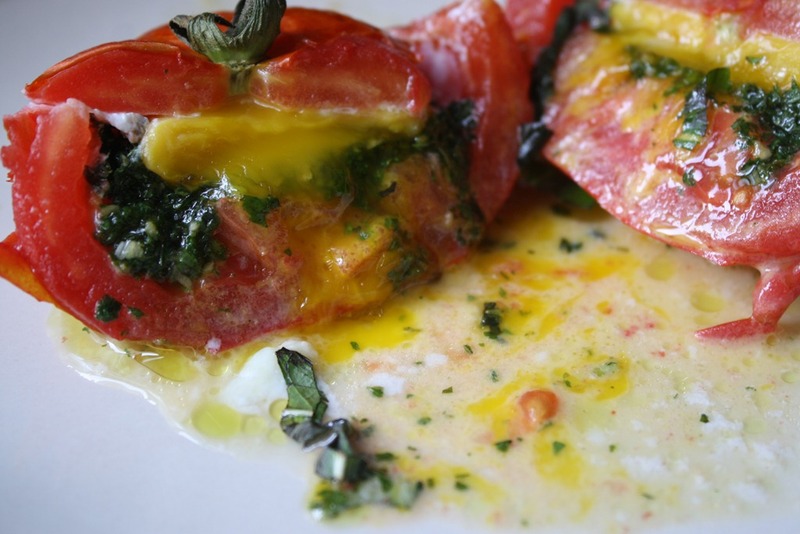 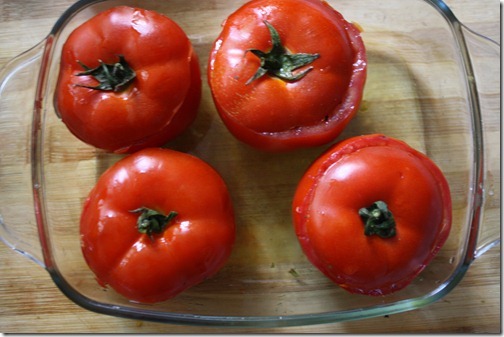 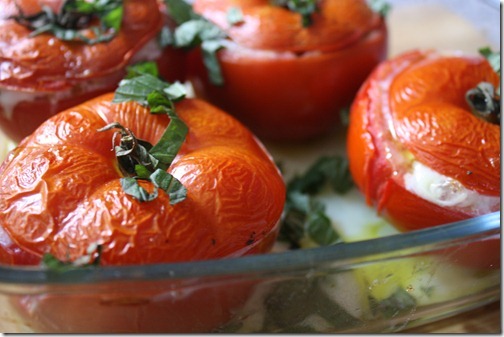 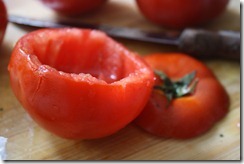 Set tomatoes in a glass baking dish that is sprayed or oiled lightly. 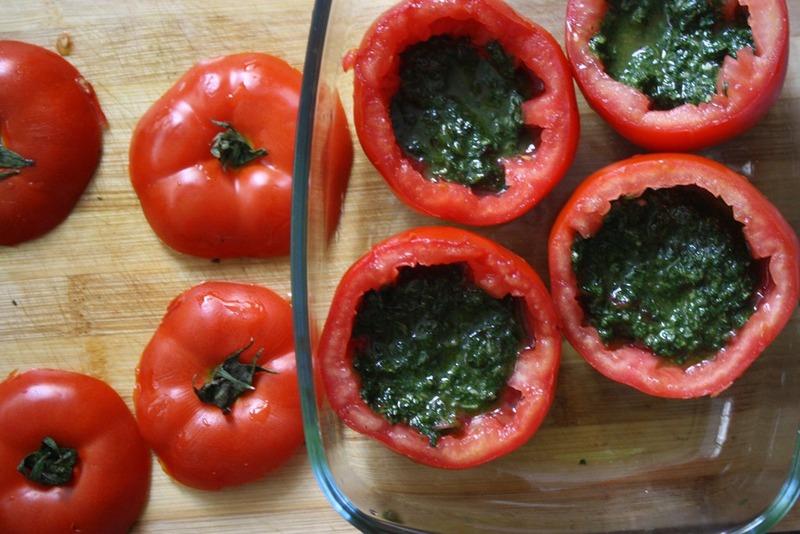 Fill a tablespoon of pesto into the bottom of each tomato cup. 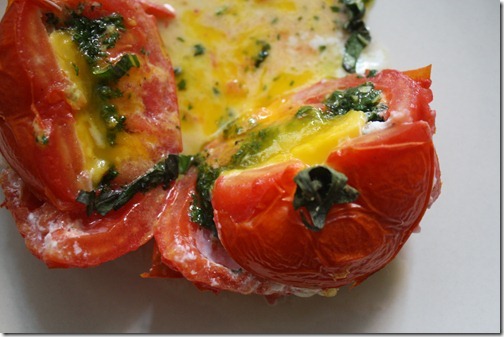 Top with a cracked egg. 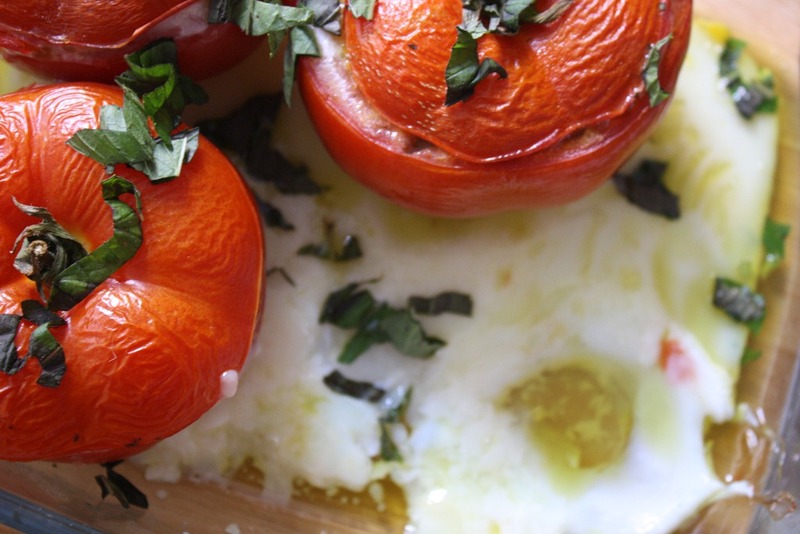 Don’t worry if the egg white overflows and runs to the bottom of the pan. 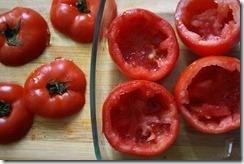 Top each tomato off with the reserved tomato lids. 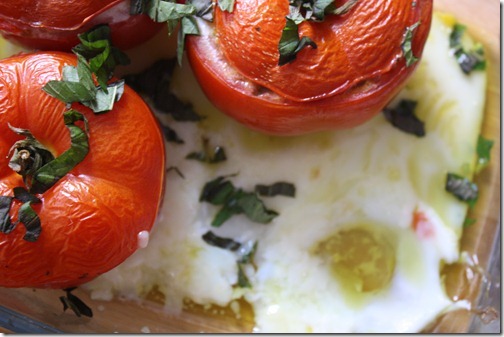 Bake at 400 degrees Fahrenheit for 25 minutes or until the egg has cooked to your liking. 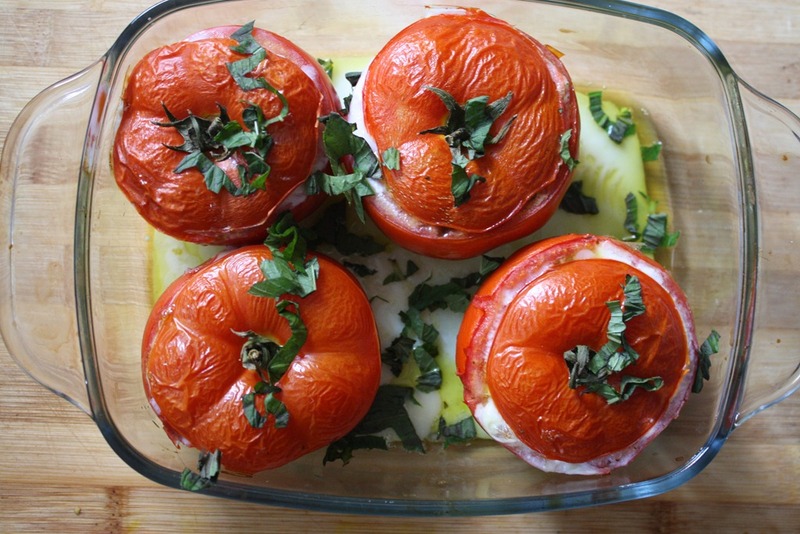 I like mine a little runny, because it’s great to dip bread into. 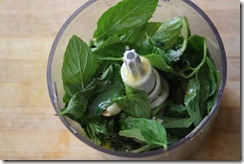 When finished, garnish with chopped fresh mint, salt, and pepper. 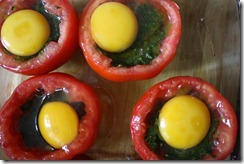 This entry was tagged breakfast, cap, cup, egg, egg yolk, mint, pesto, savory, stuffed, tomatoes. Bookmark the permalink. 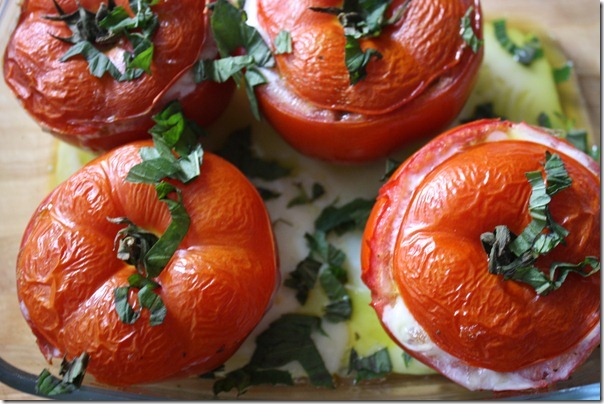 Wow this looks amazing – I can’t wait to try this recipe! 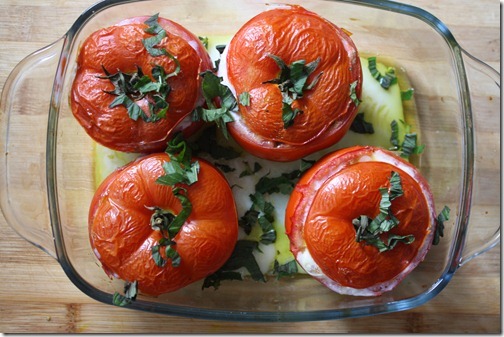 This is so creative and looks delicious!